"You needn't be a true believer to believe the goodness and greatness of this beautiful music. Right from the thrilling opening choral, Kyrie, Mozart will hook you. Only a cold heart could turn away from this piece," Simon P Keefe described The Great Mass in C minor in his book The Mostly Mozart. During his rather short yet extremely prolific lifetime, Wolfgang Amadeus Mozart (1756-1791) composed hundreds of notable works, among them two great religious compositions: Requiem in D minor (K.626) and The Great Mass (Große Messe) in C minor (K. 427/417a). Curiously, neither was completed by the composer. The Requiem is a staple of concert halls in Egypt with the last performance taking place at the Bibliotheca Alexandrina in April. "The Great Mass in C, however, has never been performed in Egypt," conductor Nayer Nagui told Ahram Online, adding that the work will be staged on two consecutive evenings, on 17 June at the All Saints Cathedral, Zamalek, and on 18 June at the Basilique Cathédrale in Heliopolis. The evening will feature Cairo Celebration Choir (CCC), soloists -- sopranos Dima Bawab and Dina Iskander, tenor Hisham Elguindy, and bass baritone Reda Elwakil -- and the orchestra that incorporates members of both the Cairo Opera and the Cairo Symphony orchestras. 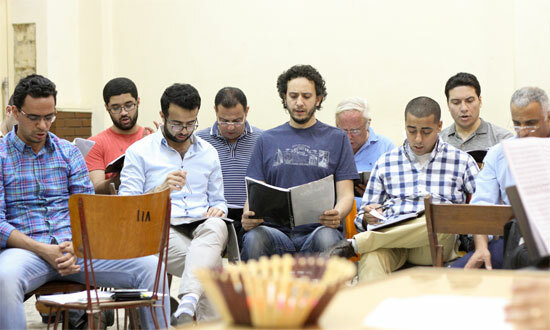 As if tracing the steps taken by the composer in the summer of 1782, when Mozart was writing the mass, listening to the Cairo Celebration Choir's rehearsal we witness the great work in the making. Flawless architecture is emotionally charged and deeply infused with overwhelming ornaments. The absolute supremacy of Mozart's genius is revealed. Yet, as breathtaking as music can ever become, the composition is a demanding task for the soloists as well as the choir. In a rehearsal room, Nagui guides the singers through the consecutive movements. They follow his instructions aware that they are about to showcase all their strengths in probably one of the most important concerts they have ever held. "I am very confident that the choir is ready to sing such a challenging work," Nagui told Ahram Online, pointing to how Mozart's Great Mass is an important pinnacle in the choir's 15-year development. 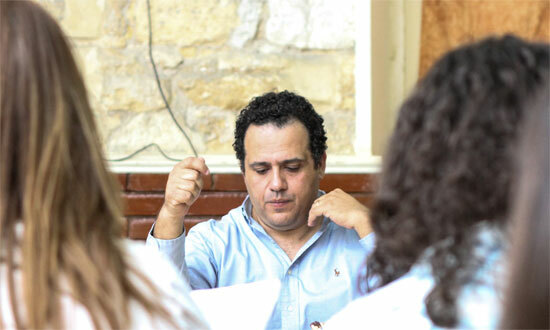 Founded in 2000 by Nagui, the Cairo Celebration Choir consists of over 100 members who are "professional amateurs," according to Nagui, explaining that the term characterises singers who are passionate about singing and are dedicated to the art, developing continuously and often studying in parallel to pursuing other careers. "The choir develops and learns through singing a large repertoire. Over the past few years, we explored many music schools. We approached the French repertoire with Gabriel Fauré's Requiem, Italian with Rossini's La Petite Messe Solennelle, German as represented by Schubert's Stabat Mater, Latin/Spanish with works by Guastavino, and we explored English style with Handel's Ode for St Cecilia's Day, a composition we performed last year," Nagui explains underscoring that covering the major schools is an important learning process for the choir. 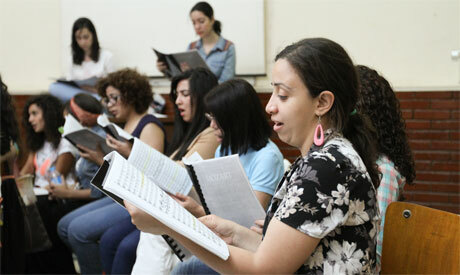 With dedication and hard work, the choir has established itself as one of the vital pillars of Egypt's cultural life. Aside from large choral works, the choir regularly participates in the annual Christmas Concert organised at the Cairo Opera House where they are joined by the Cairo Opera Orchestra and soloists from the Cairo Opera Company. On the other hand, it's Aghani Bel Arabi repertoire includes famous Egyptian choral works by Sayed Darwish and Gamal Abdel-Reheim, arranged by Nagui. The choir has a few international appearances on their account, in Morocco and France, among other tour events. In 2012, the choir participated in the Czech Republic's Prague Voices 2012 Festival, winning the Silver Level Diploma. Nagui says the choir is at the threshold of an important and new chapter: "After years of training and performances, the CCC is finally ready to begin exploring the most serious choral works." The choir's development is paralleled by many dynamic advances within its logistical organisation. "For over a year now, we work on paralleling artistic development with a strong operational backbone. All our future plans for further strengthening will in large part rely on our 'vision team' — a group of people dividing the choir's organisational, marketing and promotional work between themselves." The strength of the "vision team" is obvious in the way the choir approaches advertising its upcoming concert. The extensive campaign includes, yet is not limited to, a boosted presence on social media along with a promotional video — the latter being a first for the CCC. Nagui asserts that while the choir's history and development allows it to present Mozart's Great Mass with confidence, internal developments will allow the CCC to reach the new grounds in professional music. Audiences will be able to witness this development for themselves in a number of choir concerts scheduled in upcoming months. It is in this context that the excitement and anticipation around the choir's performance of Mozart's Great Mass becomes so palpable, in opening what promises to be a new horizon of achievement with one of the world's greatest musical masterpieces. Soloists: sopranos Dima Bawab and Dina Iskander, tenor Hisham Elguindy, bass baritone Reda Elwakil. Conductor: Nayer Nagui.